Growing Up | Joe Quatrone, Jr. In my next series of posts, I will endea vor to put into words some of the things I have learned (and am learning) through experience and God’s Word about growing up. I am by no means claiming to have “arrived.” I am simply trying my best to live out God’s specific plan for my life and pass along whatever insights I learn along the way. All people are unique and God has a specific plan for each of us. The right road for one is the wrong road for another. The journey of life is not paved in blacktop; it is not brightly lit like the “Yellow Brick Road.” It is a rocky path through the wilderness. It is not a linear road where we take one step after another in a straightforward progression. That is not what the road is like. Rather, it is a series of twists and turns, and there is nothing simple or straightforward about it. Just as Adam was banished from the Garden of Eden because of his sin and could not go back, neither can we. We can only go forward. To go back would be like trying to return to our mother’s womb, to infancy. Since we cannot go back, we must grow up. We can only go forward through the twists and turns of life, making our way over parched and barren ground. When I was a child, growing up seemed very attractive to me. Most children dream of what they will become when they “grow up.” Now that I am an adult, I recognize the value of growing up even more. There are many ways in which we must grow up. This is an extremely important truth because a great deal of our problems arise out of the attempt to get back to infancy and not grow up. We must go forward through the desert, but that journey is hard and often painful. And so most people stop their journey as quickly as they can. They find what looks like a safe place, burrow their head, and stay there; rather than go forward through the painful desert, which is filled with cactuses, thorns, and sharp rocks. Even for those who have been taught that the process of growth is valuable, the education of the desert is so painful that they discontinue it as early as they can. 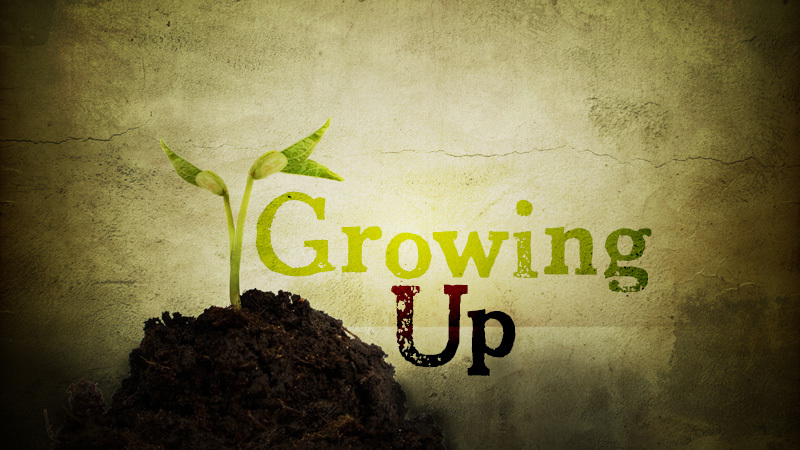 What causes the refusal to grow up? Those who stop learning and growing early in their lives stop changing. They become fixed and lapse into what psychology calls their “second childhood.” They become whiny, demanding, and self-centered. But this is not because they have entered their second childhood. They have never left their first and the veneer of adulthood is worn thin, revealing the emotional child that lurks underneath. The same is true for Christians who do not grow up spiritually and remain immature in the faith. I know many people who look like adults, but are actually emotional and spiritual children, walking around in adult’s clothing. There are relatively few adults who come out of immaturity, who are no longer willing to tolerate their own childishness. The rest of the population never manages to fully grow up. And so we need to comfort each other on our journey as we struggle along our rocky path and our pain. More often than not, the most healing thing that we can do with someone who is in pain, rather than trying to get rid of that pain, is to sit there and be willing to share it. We have to learn to hear and bear other people’s pain. We need to become more conscious and sensitive of their burdens and sorrows. Talking is not nearly as important as being available for those who are suffering. Those who are hurting need to be loved, just as Christ loves us. As we grow up, we can take on more and more of other people’s pain, and then the most amazing thing happens: the more pain we are willing to take on, the more joy we will begin to feel. Jesus took on tremendous pain when He died for the sins of the world. How much pain and sorrow are you and I willing to take on out of love for one another? This entry was posted in Topical and tagged Changed Life, Christian, Compassion, Devotions, Grace, Love, Mature, Repent, Sanctification, Spiritual Growth. Bookmark the permalink. Your blog topic was very timely. My husband recently went home to be with the Lord and I had just hung up the phone with my son after telling him I have to decide what I’m going to do when I grow up. The pain we encountered prior to my husband’s homegoing was the worst thing I have ever encountered, but God was faithful. I’m trusting He will use it in the lives of others. When people ask me how I am doing, I tell them for now, I’m just putting one foot in front of the other, but that is forward movement. Thanks for your blog. Thanks Pam. I cannot fully comprehend the pain involved in the death of a spouse as I am still married. I imagine the pain is excruciating. As you say, accepting reality and moving forward in whatever God has for you in this season of your life is the best thing you can do. My prayers are with you, my friend. I see so much of my life and the lives of people everywhere in your words. Trusting God to see us through, is extremely hard when rough times come. Some people can get through the really hard times and some cannot. We are all individuals living our lives. Maturity comes when you can finally sit down, look around, feel others pain, love with abandon, and enjoy what we have, no matter how big or how small. There are no promises in life, except God’s promise of Jesus Christ, the sacrifice of His Son, who died for our sins, so we too may have eternal life in His Kingdom. This is the greatest love and gift of God. All we need is to believe in Jesus, and we are saved and know our future is secure in Him. Thanks for the lesson, Joe. It was beautifully written as always! Thanks Rita. Absolute trust in God can be difficult while we are struggling. That is why we must remain secure in God’s promises to us. I am learning to abandon the urge to simplify everything, to look for formulas and easy answers. I have seen a lot of people destroy each other with quick fixes in the name of healing. Thank you. You lesson was very heartfelt. Ver well written. May God fully bless your work and blog to reach out to many other readers.I am 70 years old and am still learning to walk the narrow path until my Heavenly Father welcomes me home. With Jesus, I am looking forward for that day. Thanks for sharing. Many do not understand how to handle pain because it strikes close to our own hearts and is something not easily dealt with. Most of the time folks just need to know that someone cares and a hug goes a long way. Great Job! Thanks Al. Calamity can ambush us at anytime. Life can be going well until a phone call, letter, or knock at the door suddenly turns our world upside down. That is what happened to Job. He was a devoted follower of the Lord’s, but then his life caved in. He lost his children, wealth, and health for no apparent reason. Suffering is never pleasant, but difficult times remind us of our frailty and need for God. Suffering builds character if we respond with trust and obedience. Difficult times teach us how to comfort others who are faced with similar trials. Suffering tests our faith. Here is what we can learn from the book of Job about helping those who are hurting: more than a Bible verse or lecture, those who are grieving need arms to hug them, ears to listen, shoulders to cry on, and hands to help them. As you say, talking is not nearly as important as being available. Those who are hurting need our love. I think of the J. B. Phillips classic book, “Your God is Too Small.” Many spiritual problems of adults, he writes, flow from inadequate God concepts. They might have been all that we could grasp as juveniles, but do not satisfy when we are adults. Good point! When disaster fell upon Job, his closest friends did what any close friend would do. They dropped everything and came to sympathize with him during his devastation. For a solid week, they said nothing. They simply made Job aware of their presence, weeping with him and suffering silently with him. But when Job began to question the Lord and express the deep grief inside him, they forgot all about comforting and turned to correcting. “You must be in sin!” they lectured. “Your understanding of God is all wrong!” The more their accusations flew the more heated the discussion became. Instead of sympathy, sarcasm flourished. Tender hearts were replaced with hot tempers. Why do Job’s friends act this way? Because they proceed from a faulty explanation: they believe that sin causes all suffering. At a certain stage of many people’s spiritual life, this simplistic belief reinforces itself. At an immature stage of my spiritual life, I may judge others in order to feel good about myself. This makes me quite conscious of other people’s faults (needless to say, my judgments are often quite inaccurate). I am susceptible both to fixating on others’ sins and to accepting the explanation that their sin is causing their suffering. Agreed, except that I call Job’s acquaintances alleged friends. I often wonder why people abandon family when there is trouble. Do they think that person will embarrass them. The same thing when someone is trying hard to work out their problems like Job was. His friends turned his cries into something he did wrong, and therefore sinful. The homeless person would be an embarrassment for the family. The homeless person must have done something terribly wrong and the family don’t want that taint to effect their lives. They judge the person who is down and out as lazy, or did this to themselves and therefore must do for themselves. They turn wrathful because this has happened to them and blame the person for their choices. quote, which helps me to understand what happened to Job and to others when family or friends abandon them. Thanks Tom. That’s a great quote. God bless! “How much pain and sorrow are you and I willing to take on out of love for one another? ” you showed how much Pastor Joe and you also showed your respect for others in the Body of Christ I’m thankful that I’m not depending on you for my self-worth. You are too kind, Anne. Thanks for your uplifting words. God bless! I am not the pastor, but I found this explanation and believe it fits your question:. When we receive Jesus Christ believe in Him His death, burial and resurrection, our lives change. The old ways are gone, and we we draw closer. This transition changes us from our old self. Good question Journey! It was customary for a mother to bring her children to a rabbi for a blessing, and that is why these mothers in Luke 18 gathered around Jesus. The disciples, however, thought the children were unworthy of the Master’s time and attention – less important than whatever else He was doing. But Jesus welcomed them because children have the kind of faith and trust needed to enter God’s kingdom. It is important we bring our children to Jesus and we ourselves approach Him with childlike attitudes of acceptance, faith, and trust. Hope this helps! (BTW – I’ll be posting another article about “growing up” later today or tomorrow). Stay in touch, my friend!